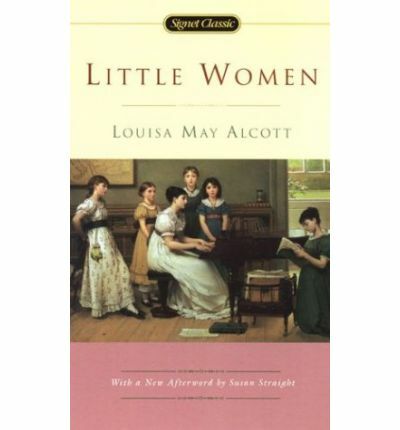 Little Women is set in New England, during the time of the American Civil War. The little women in question are the March sisters – Meg, Jo, Beth and Amy. Their family was once comfortably well off but those fortunes are now reversed. Mr March is off serving as a Chaplain in the Union Army, while at home the girls are guided by their mother whom they call Marmee. It is considered to be loosely based on Alcott’s own childhood and adolescence. This book has sat unread on my shelves for a great number of years and joined the Bedside Pile this past week. My trepidation seems to have stemmed from this particular edition’s size (321 pages) and vaguely dull impressions gained from seeing the odd snippets of television movies. We each have our own literary leanings, both positive and negative, and in my case I am not attracted to 19th Century American literature. Sadly I have no idea why this is the case. The girls are effectively split into two groups. The elder sisters, Meg and Jo, who are sixteen and fifteen at the start of the book go out to work in order to help support themselves and take a bit of the financial burden off the family. The younger sisters, Beth and Amy either do lessons at home or attend school. To add some male influence to the group, there is Theodore Laurence or “Laurie” and his grandfather, the family’s wealthy neighbours. Laurie becomes as a brother to the girls and Mr Laurence a general protector with a special soft spot for Beth. In addition, there is Mr March’s aunt, for whom Jo works as a companion and is known to the family as Aunt March. Each of the girls has a distinct personality. Amy is the artist of the family but she is also selfish. Beth is the peacemaker and musician but extremely shy. Jo is the writer who is quick to temper, and is occasionally too blunt. Meg is the prettiest who wishes for fine things and to be rich. The book is written in part as a story about the passage to adulthood and the alterations in character that each of the girls must go through as they grow up. It is full of references to The Pilgrim’s Progress and the journey Christian takes. Pilgrimage had been a game the girls had played at while younger. But now that their father is away for an uncertain amount of time they collectively decide that they should each set about taming the negative aspect of their personalities. In this way they wish to show their father that they had not wasted the time that he was away at war and in doing so gain his good regard. It is quite a charming story. It is full of good morals and does a fine job of not being too preachy with it. As it turned out, the 321 pages gave no real trouble and in the end was read over three nights. There is a sequel, Good Wives, specifically about the next stage in the March girl’s lives. Following on from that are the books Little Men and Jo’s Boys, all about Jo’s family. Having enjoyed Alcott’s writing style here I may be tempted, once the Bedside Pile is under control, to find those at the library. Just a final note, Little Women appears at number 19 on the BBC Top 200 list and it well deserves its place there. Do you mean the BBC Top 200? Read them all! They are wonderful.